Much like an architect, famed glass sculptor Dale Chihuly believes the “magic is in the light.” When studying interior design, Chihuly became fascinated with glasshouses and eventually became a glassblower. After a 1976 car accident left him blind in one eye and a bodysurfing accident dislocated his shoulder, Chihuly realized he needed to work with a team. 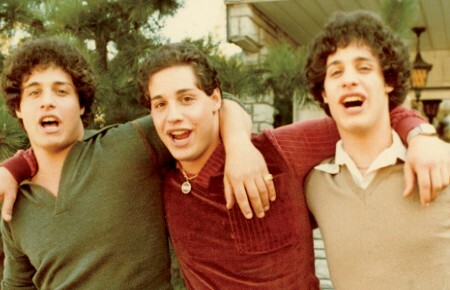 This allowed him to think bigger, leading to glass installations in places like Venice, Israel and London. 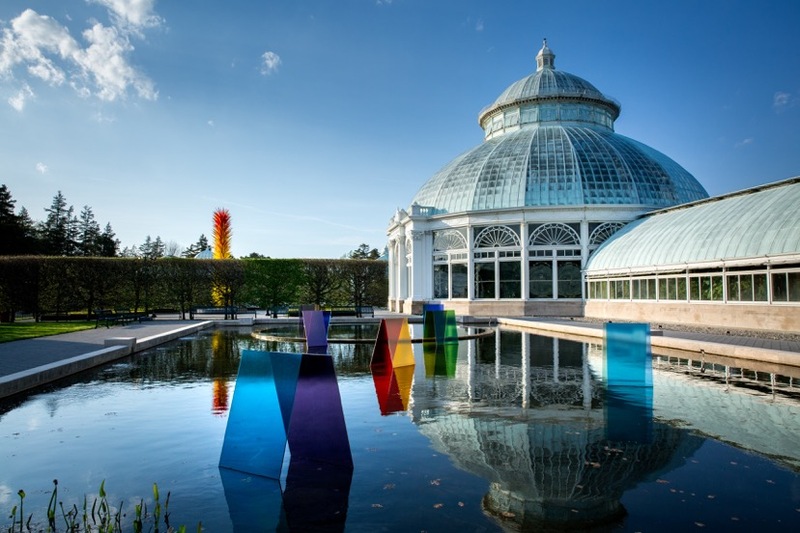 Now through the end of October, the New York Botanical Garden (NYBG) will host 20 of the Seattle-based artist’s whimsical, glass installations—from a sunny citrus fruit and a spiky sapphire star to red reeds and floating panels of polycarbonate. Inspired by architecture, film, art and nature, the sculptor likes botanical settings, which allow one to question if something is art or native to the landscape. It’s been over 10 years since Chihuly exhibited at NYBG and a piece called Blue Herons is making an encore appearance. 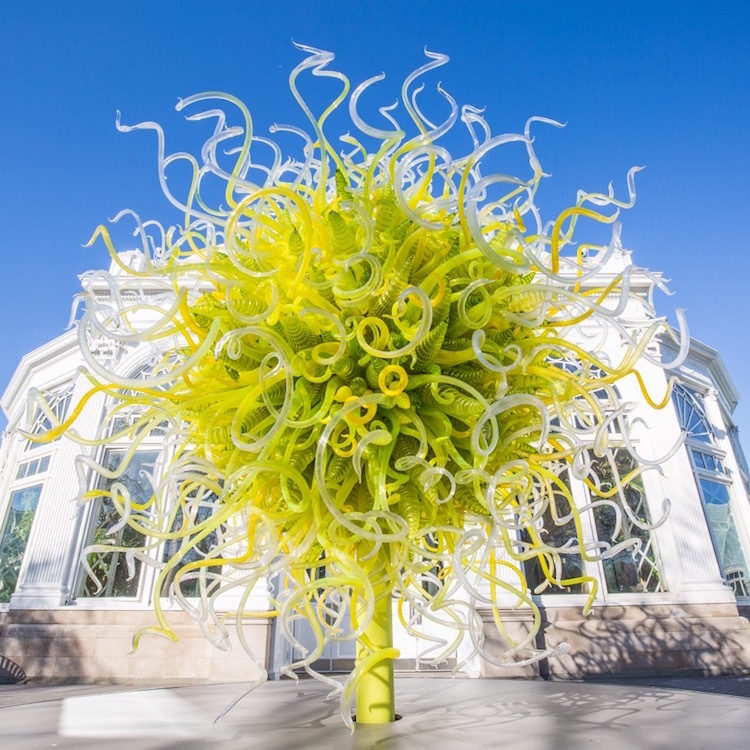 In an homage to the 2006 exhibition, the piece will be featured in a new display within the historic Enid A. Haupt Conservatory, also considered a work of glass art. There will be CHIHULY Nights on Saturdays through June 24 (with alternating nights through October) during which the artworks will be illuminated from 6:30-10:30pm. A rotating lineup of performing artists and musicians will perform in the Visitor Center plaza with food and drinks available. The NYBG Summer Concert Series: JAZZ & CHIHULY takes place on the Conservatory lawn on a Friday in June, July and August. BYO blankets and chairs and check out the glistening CHIHULY artworks between acts. NYBG’s Assoc. V.P. for Exhibitions, Karen Daubmann, discusses the details of the CHIHULY 2017 exhibit—from logistics and style to new installations and drawings. 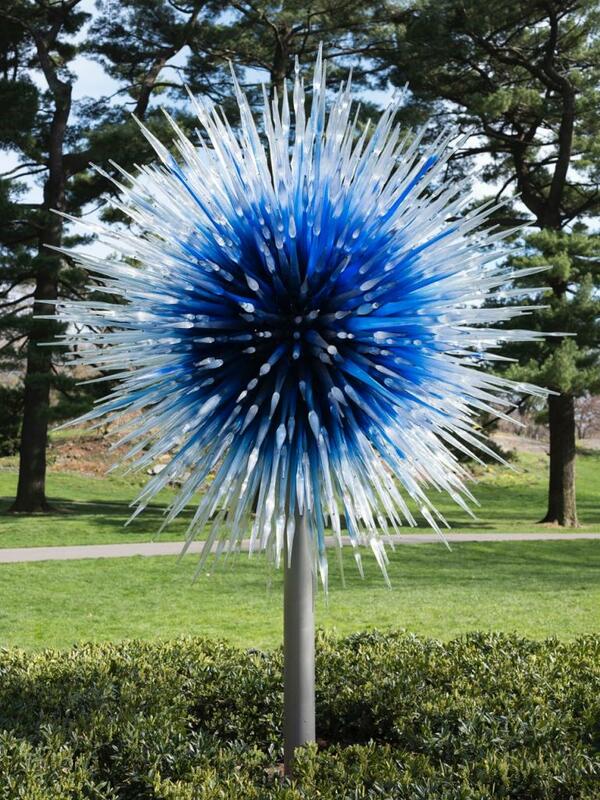 How does the current CHIHULY exhibit at NYBG differ from the one he had there in 2006? It explores artist Dale Chihuly’s legacy and, unlike the exhibition in 2006, it also includes drawings and early works that reveal the evolution and development of his artistic process. The water features in the Native Plant Garden and the Conservatory Courtyard’s Tropical Pool are the settings for dramatic new artworks inspired by Chihuly’s summer 1975 Artpark installation when he collaborated with (painter) Seaver Leslie to create temporary outdoor works in Lewiston, New York, near Niagara Falls. Using sheets of stained glass, the installations were designed to provide contrast between the glass and the surrounding environment, resulting in a physical expression of light. Chihuly revisits this concept to create three new compositions—Koda Study #1 and Koda Study #2 in the Native Plant Garden and Koda Study #3 in the Conservatory Courtyard Tropical Pool. The new works, made of polycarbonate sheets, provide a rare opportunity to view the stunning effects of reflection and light created by these colored panels as day transitions to night. This exhibition also boasts Chihuly’s dramatic, new multicolor installation, Neon 206, in the Conservatory Courtyard, where he takes advantage of the iconic venue’s reflective qualities. How do you describe Dale Chihuly’s style? He’s an American artist whose ideas are aligned with the great 20th-century abstract artists of his generation. He’s mastered the translucent and transparent qualities of ice, water, glass and neon, to create works of art that transform the everyday experience. 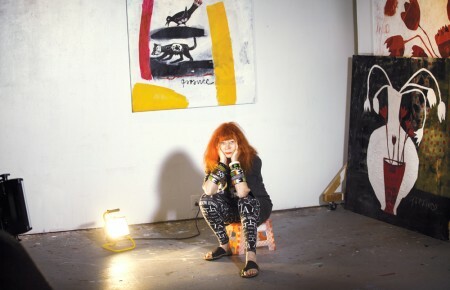 Drawing and painting on paper have also been a consistent form of expression throughout his career—both as a means of communicating with his team and as their own creative outlet. Which piece is most striking to you, and why? My favorite is Sol de Citron in front of the Enid A. Haupt Conservatory. The massive piece took four team members four days to install. It’s wild and unruly looking from afar but, as you get up close, you see the variation of the glass forms used. It is perfectly placed in front of the Conservatory—instead of obstructing the iconic glasshouse façade, it adds a certain whimsy to it. And it’s one of my favorite installations at night as well. How are his works illuminated for CHIHULY Nights? Lighting the CHIHULY exhibit was an endeavor that started months before the actual installation took place. Throughout the Garden, we worked to distribute power to the locations where the artwork was to be placed. Once Team Chihuly started installing glass, their team of lighting designers assisted my garden staff and a local lighting company followed behind to ensure that all pieces were artistically lit. Only Neon 206 is inherently lit—the rest of the works rely on strategically placed lighting. The team knows how to light the glass without using LED lighting, and the result is spectacular.